New: Acerola Bio Plus chewable tablets with the essential antioxidant, vitamin C. With ORGANIC cane sugar for great flavor, suitable for children, too. 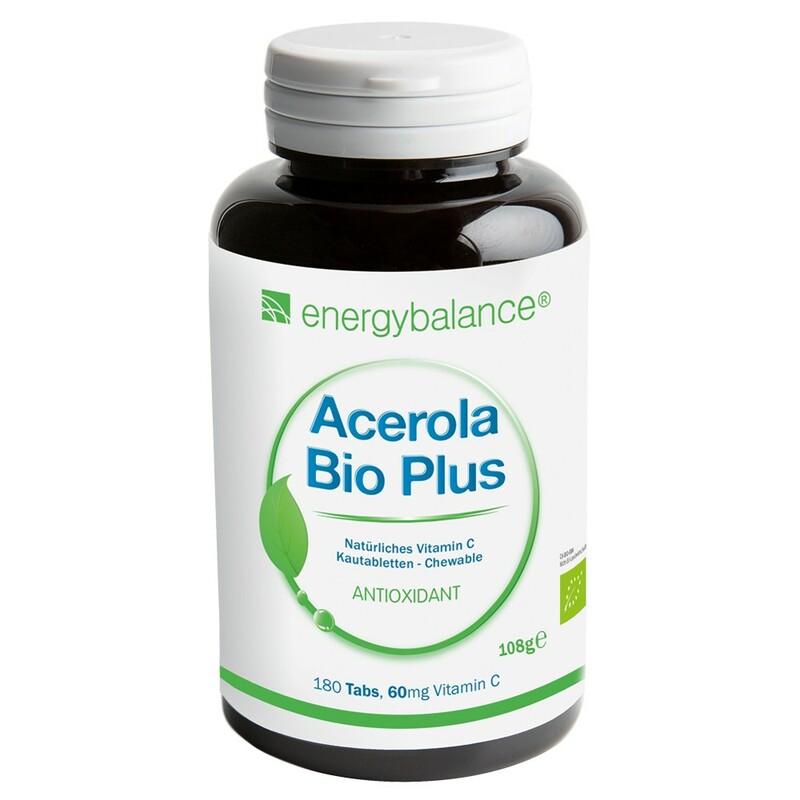 ACEROLA Bio Plus only contains vitamin C naturally found in acerola fruit concentrate. NO artificial vitamin C. Our products give you more for your money> see the price comparison! Better than normal vitamin C. Tasty ACEROLA chewable tablets each containing 60mg natural vitamin C from acerola fruit concentrate. Neutralizes free radicals, boosts the immune system. Essential, needs to be provided to the body through the food you eat. Acerola extracts can only contain a maximum of 17% natural vitamin C. If vitamin C content is higher than 17%, the extract was stretched or standardized using artificial/synthetic vitamin C. Customers don't know how much of the vitamin C contained in a product with 20% is natural. The body has a hard time absorbing artificial vitamin C, which means it is not very effective! Most vitamin C products are made from artificial (synthetic) ascorbic acid. The ascorbic acid in these products is isolated, i.e., not surrounded by nutritional elements and without nutritive value. The body has a hard time processing isolated ascorbic acid, even when it is taken in doses over time, which means it has almost no effect at all. What's more, high doses can even be harmful. Nutritive vitamin C, like the vitamin C contained in this product, is surrounded by proteins, carbohydrates, lipids and plant substances and is tied to these substances, making it easy for the body to process and enabling full effectiveness. Acerola powder contains a maximum of 17% natural vitamin C. The product by ZeinPharma contains 500mg of acerola powder per tablet, which means that it can only contain 17% or 85mg of natural vitamin C.
The product by ZeinPharma contains 500mg of acerola powder per tablet, which means that it can only contain 17% or 85mg of natural vitamin C. However, the product contains 125mg of vitamin C. In other words, it is possible that this product only contains 5mg of natural vitamin C and 120mg of artificial vitamin C.
There are a number of acerola products on the market, but most of them contain (synthetic) artificial ascorbic acid, which is hard for the body to process, in addition to acerola. That's why you should always pay attention to the amount of natural vitamin C a product claims to contain, e.g., whether each tablet contains 80mg natural vitamin C. Unfortunately, the labels of many products are misleading, giving customers the impression that they only contain vitamin C from acerola fruit powder. If an acerola product is not labeled as containing ""natural"" vitamin C, it most likely contains artificial ascorbic acid and is not of the same quality as our product. This product contains natural fruit powder from acerola cherries with 17% natural vitamin C. An acerola cherry provides 30-times as much vitamin C as a lemon. Acerola cherries, which are native to the tropics, are second only to camu camu when it comes to natural vitamin C content. Unlike ascorbic acid, acerola vitamin C also contains other natural plant substances. These additional antioxidants, otherwise known as phytochemicals, increase the effectiveness of the vitamin C contained in acerola cherries. Vitamin C is an essential antioxidant and cannot be produced by the human body. Your body gets the vitamin C it needs from the food you eat. Vitamin C helps maintain healthy bones, teeth, gums and blood vessels and it helps the body absorb the trace element iron. As an antioxidant, vitamin C can neutralize harmful free radicals. Our product only contains natural vitamin C and its bioavailability is considerably better than vitamin C from isolated ascorbic acid. Adults, teenagers and small children: chew or let 2 to 6 tablets dissolve in the mouth a day. BIO organic acerola fruit extract with 17% natural vitamin C 60%, BIO organic dextrose, BIO organic maltodextrin, natural raspberry flavor, anticaking agent: BIO organic carnauba wax. 180 tablets each containing 60mg of natural vitamin C.